- ham or vegetables, etc. In a deep plastic container sift flour. In another small one put the yeast and dissolve it with the water pressing and kneading. Make a little hole in the middle of the flour and pour the yeast mixture bit by bit kneading continuously and strongly at the same time for about 20 min. 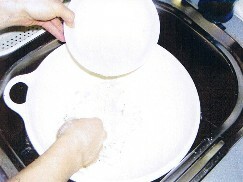 Make a round shape with the dough and leave it in its container for about 1 hour, covering with a towel or piece of cloth. Then slightly oil the baking pan and knead the dough spreading it evenly. Pinch it all over with a fork. Now spread the tomato sauce, Mozzarella and any toppings you wish. 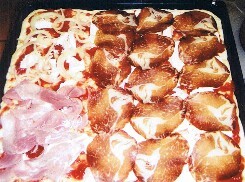 Preheat oven to 200° C and place pizza on the bottom for about 30 min. until it´s golden brown. ►Tip: If you want to speed up the process of rising of yeast, place its container in hot water.